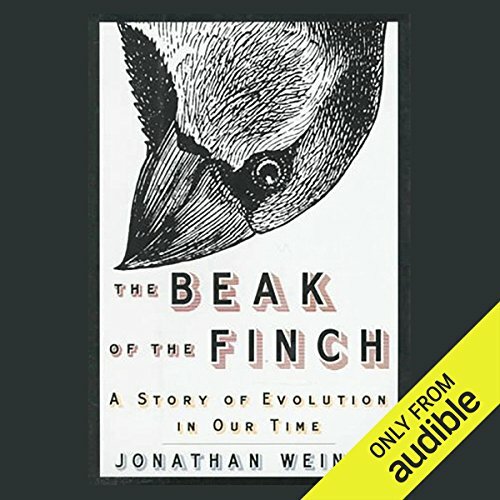 The subtitle of The Beak of the Finch — A Story of Evolution in Our Time — is the vital thematic thread of this groundbreaking Pulitzer Prize-winning book, rendered into audio by Victor Bevine’s masterful narrative performance. “Charles Darwin never witnessed natural selection in action,” states the author, Jonathan Weiner. But Princeton University professors Peter and Rosemary Grant have seen the evidence, in flourishing abundance, during their 20-year study of finches on the Galapagos Island of Daphne Major. The Grants and their assistants did so with the very finches that famously captured Darwin’s attention during his five-week exploration on the Galapagos Islands. “Evolution in our time” means that wherever there is life, the force that drives evolution, natural selection, is everywhere and always present. Evolutionary changes thus occur at a much more rapid pace than had been envisaged by Darwin, indeed, than had been thought by the Grants’ contemporary scientists. The stunning and startling beauty of this book is achieved through the convergence of an interesting collection of scientists, newly discovered findings about finches, great writing, and the extraordinary, ultra-exotic island of Daphne Major. Rosemary and Peter Grant and those assisting them have spent 20 years on Daphne Major, an island in the Galapagos, studying natural selection. They recognize each individual bird on the island, when there are 400 at the time of the author's visit or when there are over a thousand. They have observed about 20 generations of finches - continuously. Jonathan Weiner follows these scientists as they watch Darwin's finches and come up with a new understanding of life itself. ©1995 Jonathan Weiner (P)2010 Audible, Inc.
A wonderful science/biology book that combines depth (the Galapagos finch study by Rosemary and Peter Grant) and breadth (impressive overview of Darwin's discoveries, and work by his scientific followers). Accessible to a non-biologist like me, while at the same time introducing many new concepts and insights from field studies. At times, the book seems to be written in a thriller style, with cliffhangers and plot turns that make you look forward to the next time you can spend time with this excellent book. Highly recommended. What made the experience of listening to The Beak of the Finch the most enjoyable? What was one of the most memorable moments of The Beak of the Finch? At the end when the thoughts are being conclusive- It is so insightful that I will think about this book for the rest of my life. It affects my everyday living and I NEVER expected that from this book. I thought it was just going to be an interesting book about Darwin's finches and the people who have studied them. Not really. There is just too much information and I need to process it in more than one sitting. Sometimes there are a few too many details and measurements, but overall this is a really good book. Maybe great, well it would be great with a few less bird details. I like bird stuff but what was the most amazing was side stories on other animals like the white and black moths in England etc. Wow! Our planet is wonderful and after reading this my commitment to taking good care of it is even stronger. You can never see the world the same again if you read this. We live on a beautiful planet and this book really gives a clear view of just how wonderful it is, thanks to the hard work of a lot of very patient people. Evolution made material, without anthropology. Did you know that the illegal ivory trade is causing elephants to be born with shorter or non-existent tusks. Well written and fascinating for the evolution buff. A must read! This was an extremely interesting book. I listened to it twice. If you want to really understand how evolution works, how the environment molds and shape species then this is the book to get. If you doubt evolution is real...listen to this book. It's probably the best case study of evolution in motion. For people who don't have a strong science background, but do believe in evolution and natural selection - the next time some fan of Fox News tells you with great confidence that "Darwin's Theory of Evolution was just a theory. It hasn't been proven," you can whip this book out of your backpack and beat them with it. Completely accessible, written with a strong narrative arc that keeps you turning pages, Weiner has created a compelling work of popular science. He summarizes, in layman's terms, some of the great field research projects that usually scientists only talk about to each other. Projects where natural selection, sexual selection and hybridization have been observed to change species within the span of human observation. That's right, folks, proof after proof of evolution in various ways - theory no longer. Weiner then goes on to relate these proofs to other touchstones in our lives - drug-resistant viruses, catastrophic weather events. This is a darn good read as well as being a sensible antidote to the anti-science wave of foolishness sweeping the U.S. The book was excellent and really detailed, which was good to a point. I don't know what I would have cut as an editor because it was an insightful examination of the Finches and other examples of speciation, but I found that at the halfway point I found myself thinking "really only I am only half way through the book? I could teach a course on this from the information that I have been given so far. What more could they possibly have to say?" Then the author would give me more great information that backed what he was saying. Really an insightful and information packed read that gives the Real world life of scientists actively doing science and teh results that they are coming up with. Just a bit too long. This book is literally about the beaks of finches in the Galapagos. And it's also about natural selection, but as it relates to these finches. The first 25% I thought I'd lose my mind if they talked about the beaks of these finches anymore, but then I got fascinated. The patience these scientists have is amazing. Years and years of work to understand these microscopic developmental changes. It's pretty mind blowing. What I think I found most interesting was the birds reactions to drought and El Nino. Shortly after I finished this I started Guns, Germs, and Steel: The Fates of Human Societies and in a million years, I wouldn't have thought the two were in any way related, but it turns out that (among other things) Jared Diamond is an evolutionary biologist, so &quot;Beak&quot; laid a very good foundation for what I've heard so far in this new book. Who knew science could be interesting? If you want to understand the modern science of evolution (it's not a theory anymore), and some of the fascinating work that has been done to elucidate its mechanisms, this is the book for you. It is thorough, varied, and fascinating. yes. the knowledge and science were very enlightening. the observation of evolution in real time is very fascinating. What other book might you compare The Beak of the Finch to and why? his voice was as captivating as the subject matter. amazed that this information gathering was possible in less than a person's lifetime and the additional proof of evolution. Just to be clear: I never read the print version. I am taking an evolution course at my university and the professor "suggested" this book. The beginning is very slow; the first maybe four chapters. But then it gets interesting and then...even more interesting. This book covers evolution as it is visible and measurable as well as the theories of Darwin and the like. I enjoyed the reading by Victor Bevine, but I cannot say whether this has added to the book or not, being that there were no "characters" to be portrayed and no real "story" to be told.